Fallout 4 is a real thing finally, and Fallout players are insanely excited about it. The team behind Fallout: Project Brazil doesn’t have much time left. They have to beat it to release. 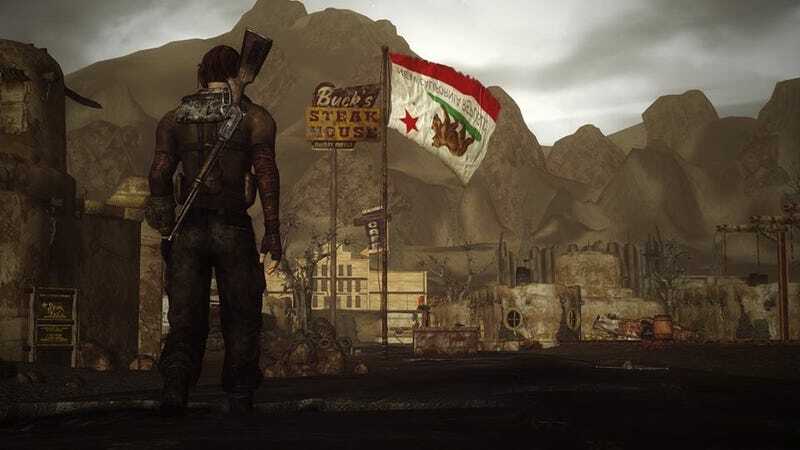 Project Brazil is a massive story mod for Fallout: New Vegas that includes its own campaign set in San Bernardino, California and a whole new wasteland for players to explore. It’s been in development for years, and part of it is already out. When you’re essentially making a new Fallout game, however, it’s a little disconcerting to hear that someone else—in this case, the people who kinda own the entire series—is making a new Fallout game. After all, what happens if you throw a big release bash and nobody shows up, not even a tumbleweed or a sickly radroach who’s been stuck in that corner for weeks and might actually be dead? What if everybody’s already moved on to Fallout 4, making years of hard work worthless? Contrary to what you might expect, the Project Brazil team isn’t considering rebooting their massive mod undertaking in Fallout 4. The Fallout mod community, Lee told me, has started putting an emphasis on sunsetting Fallout: New Vegas’ GECK (the nickname Bethesda gave the series’ official mod tools) and preparing for Fallout 4, but he’s still got unfinished business. The game’s impending release has lit a fire under Lee and his volunteer team, although they’d be lying if they said it didn’t feel like that fire is on a fuse attached to a ticking time bomb. Their goal? To beat Fallout 4 to the punch. This means that the team is likely gonna have to polish off the mod long before they were planning to. Fallout 4 doesn’t have a release date yet, but since Bethesda is already advertising it, Lee and co are expecting it to come out later this year. That means Project Brazil will need to be finished somewhere in the neighborhood of six months early. If you’re anything like me, you might be inclined to worry that this means the final version will be sloppy or lighter on content than originally planned. But Lee’s not planning to crack the whip on his team until either it breaks or they do. He wants to bring in a few additional people and get everybody focused—himself included. Bethesda’s recent actions have helped Project Brazil in other ways, too. The paid Steam mod fiasco might have split Skyrim’s mod community in two, but it brought Project Brazil’s team closer together than ever. So the race is on. Or rather, it’s out in the open after both Fallout: Project Brazil’s team and Bethesda plugged away in silence for years. And despite fears that Fallout 4 might overshadow Project Brazil, Lee is hoping to build something that endears itself to players, something that lasts. If you think about it, it’s kind of the opposite of pretty much every scenario in Fallout history: whoever wins, we win. Well, unless, like, Fallout 4 is complete garbage or something. I reeeeeally doubt that’s gonna happen, though.